Sometimes, you just need it easy. Flexibility is great, sure. Options. Quality. Power. All in their place. But when you just need to get a podcast recorded and time’s a’wastin? Easy is the way. But what happens when easy miraculously co-oincides with quality? With flexibility? Awesome sauce. Right here I want to talk about just that: a super-simple, high-quality, equipment setup for recording podcast interviews. 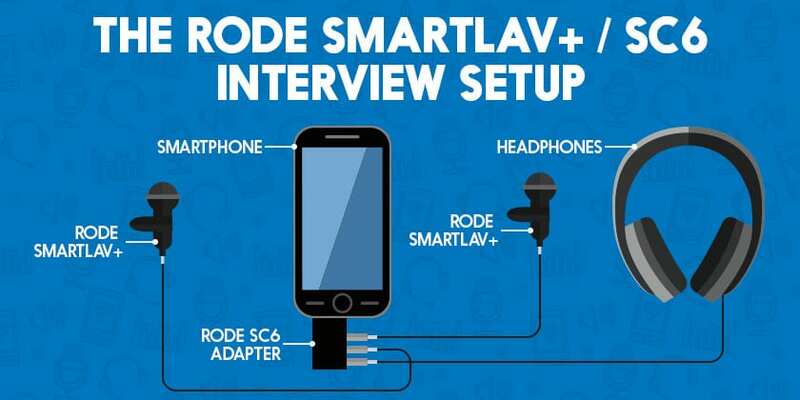 The Rode Smartlav+ lavalier microphone and the SC6 adapter. Want the short story? Skip to the equipment setup. Want the long story: the how and the why? Read on! What is the Rode Smartlav+? Despite the fact that we talk about a lot of ways to do a podcast, interview recording setups are still the most common reader question. The Rode Smartlav+ is my stock answer for most of them. The Smarlav+ is a lavalier microphone, which means it’s a tiny little device designed to clip to your shirt. Think back to the last in-studio TV interview you saw. Did you spot that little black dot stuck to their chest? That’s a lavalier microphone. Lavs are designed to be subtle for that exact purpose. To allow one or more people to speak without the visual or the physical bother of a microphone. But, they come with other advantages too. Why Are Lavalier Microphones Great for Interviews? The usual alternative for interviews is a hand-held mic, like the Shure SM58 or the Samson Q2U. The problem with them is that your interviewee probably hasn’t held a mic before. If they have, then it’s likely without any training. Sadly, without training, it’s easy to mess up a recording beyond all help. Handheld mics should be held a particular distance from the mouth, and in a particular position. They should also be handled really carefully to avoid nasty handling noises. You can’t expect an inexperienced interviewee to get all of that right. Sometimes they’ll be too far away, or too close at others, popping the mic like a crazed peter piper picking a peck of pickled peppers. Lav mics get rid of all of that. It’s pinned in one place and, from there, technique no longer matters. Ever had a really irritating, talkative co-worker who just won’t shut up? Here’s a tip: stick a big mic in front of them. In my experience, that’s an iron-clad way to get someone to shut their face-hole. It’s true, though. If your interviewee isn’t used to it, a microphone is intimidating. It puts the pressure on, reminding them every second that they’re being recorded. I’ve seen friendly, charismatic people transform into nervous little flowers thanks to that pressure. It’s weird how formal people become, spouting jargon and big words as if they’re trying to impress someone. And they are. The mic! A lavalier mic gets around this. You pin it on, and within minutes, the speaker’s forgotten it’s there. It means you end up having a conversation, rather than an interview. It’s more natural, more honest and much more compelling. Even with experienced co-hosts, a pair of lav mics can make for far better material. Again, it’s the act of removing the tech – turning a recording into a conversation. Why is the Rode Smartlav+ Great for Interviews? There are a bunch of lavalier mics on the market, as you can see in our lavalier roundup. So, why the Smartlav? 1. You don’t need a recorder – just a Smartphone. This is the main one: you can record with a device you’re already carrying. No need to carry a separate recorder, worrying about batteries or transferring files. Just plug the Smarlav, or the SC6, into the headphone jack on your phone, and then hit record on your voice recorder app. Every smartphone has one. If you want to get fancy, you can even upgrade your recording app. There’s plenty out there, some with mixing or editing functions like Bossjock. The smartphone gives you that flexibility, unlike a pre-set recorder. The SC6 adapter is the master-stroke here from Rode. It’s nothing more than a splitter, really, that lets you plug two Smartlavs into one smartphone. That means you can record two people with great quality, perfectly synced into one device. So simple, but so powerful! Yep, splitters have existed for years, but the quality can be variable and it’s up to the user to figure out what they need. These are made specifically for the Smartlav, and they just work. This setup is so portable that I take it everywhere I go. I have two Smartlavs and an SC6 adapter coiled up into one of the little smartlav drawstring bags. It fits in your palm and weighs less than a slice of bread. My set is always in my bag, so if I got to an event or a meeting it’s there and ready for an interview on the fly. What Else Can the Rode Smartlav+ Do? This article is all about the 2-person recording setup, but that’s not all I use my Smartlavs for. A friend of mine, Andy Brown from Triple Your Clients, used to record his podcast with a Smartlav while he was out walking his dog. It was brilliant! The forest sounds and the birds tweeting gave it so much atmosphere. He always sounded full of energy, too, because he was up and active. This isn’t limited to the Smartlav, of course. You could record, on the go, with any lav mic and a little recorder. The problem is, I wouldn’t carry a digital recorder around all the time, even a small one. I’ve always got my Smartlav and a smartphone with me, though, so recording’s a cinch. This is related to the point above. The fact that you can record on-the-go gives you loads more options when it comes to fitting your podcast in. We all know what it feels like to have our creative time squeezed. When the crazy time hits, podcasting, blogging, video are first to go. But, if you could record a podcast while you’re out for a walk, or stuck in traffic, or waiting for a bus, how much more likely are you to do it, every single week? You can problem tell, I’m a bit of a fan of the Smartlav. 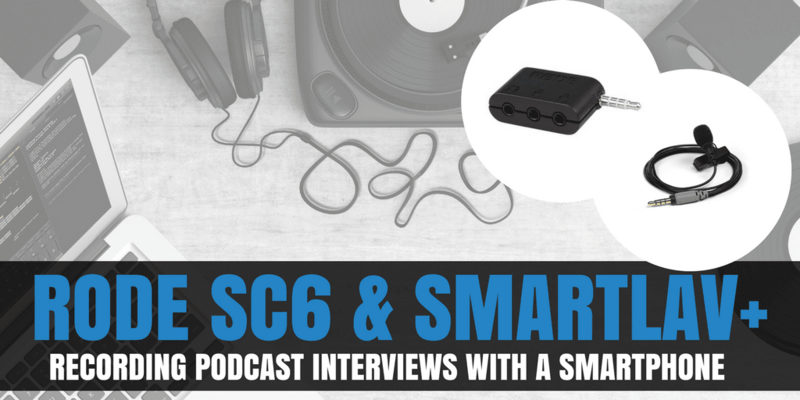 Even better, paired with the SC6 adapter it offers an interview setup that anyone can use, and can be carried in your pocket. Optional: Headphones – any kind – here’s what I use. The Rode Smartlavs plug into the SC6 and it, in turn, plugs into your Smartphone. There’s also a headphone port on the SC6 to allow you to listen back to recordings. Hence the ‘optional’ headphones listed above. This setup will turn any smartphone into a great quality two-way interview setup. Equally, it allows anyone to record a co-hosted show and offers up a bunch of flexibility in where and when you do it. Need More Help Choosing Podcast Equipment? That’s our Premium Site, where you’ll find access to all of our video courses, tutorials, ebooks, and downloadable resources. On top of that we run regular live Q&A sessions where you can get all your questions answered on an ongoing basis. It’s the ideal place to plan, launch, and grow your podcast in a focused and structured manner! Great tip! Does the SC6 split the two mics into left and right channels for editing later? Works really well. I’ve recorded stacks from this. In a pinch you can stack the sc6 with another one too but it drops the signal strength a lot. The lack of microphone jack on the new iphone is a bit of a problem now though, the adapter means you can’t charge and record at the same time and its just a chain of plugs to get it connected which is most annoying. Another excellent post. This setup seems to make a lot of sense for someone like me that is a) starting out in podcasting and b) intending to do primarily interview-based recordings in the field with nice textural sounds in the background. I will add a brief intro and outro in a (yet to be established) home studio. Is there any real need for me to invest in Blue Yeti + Roland R-05 + MG10 Mixer at stage one? Or to rephrase, could I get away with Smartlav + SC6 and create a great sounding podcast that would compete with a Radio 4 field recording for sound quality? Can you use two rode smart lav’s with a zoom h1? I don’t have enough memory generally to do the podcasts on my smart phone. i already have two rode smart lav’s and so it would save me buying two ATR-3350 if i don’t need them. also what are the headphones for? The headphones are for monitoring your recording so you can make sure everything sounds okay. I’d like to use something like this to do interviews while active (think cycling), Any particular recording app for Android you recommend that will allow me to easily edit out/decrease wind noise? And, any relatively inexpensive wireless mic’s that could be used for this? This is exactly what I’ve been looking for! Thank you! I have been a podcasting for a few years, but new employment circumstances now means I need to record over my lunch hour. I need something mobile and I’ve been trying to decide if I need to purchase a mobile recording device or if my phone would work. I do want the sound quality to be decent. My only concern is the storage on my phone for about 30 minutes worth of recording. I’m going to look into these products for sure! I am using this setup for my recordings and I love it. It is so minimal. I record with Garageband on the iPhone and transfer the files via iCloud. Is there a way to get two Smartlav’s recording split to left and right channels? I found the adapter for trs lava, but not trrs. Did you get any luck with this? I’m struggling to find any solutions! Does this set up work for both Iphone and Android including laptop too, I mean plugging the adapter to the laptop headphone Jack then plug in the lav mic and start recording. Anyone had luck with finding a way to split the two Smartlav + mics onto their own channels when recorded on the phone? I would be so worried about crosstalk, etc, plus not being able to edit each different vocal separately without a huge hassle to split the vocals. Any ideas here so welcome! Excellent post. Taking your idea one stage further, could I interview two or more guest with this equipment set up? If not, what would you propose?